If you can’t make it outside to actually check out the solar eclipse, don’t worry, because Facebook and Snap have you covered. Facebook has partnered with NASA for a live stream of the eclipse, starting at noon ET. The event will be highlighted from several different locations, including the International Space Station, on NASA’s Facebook page. No fancy glasses are necessary. News organizations are turning to Facebook to broadcast the eclipse, too, with NBC News, CNN and Time all showcasing it on their own Facebook Live streams. 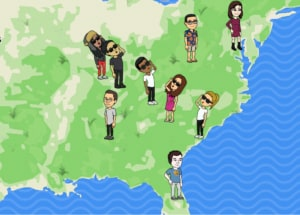 Snapchat is also set for the eclipse, which won’t happen again for another seven years in the U.S. Users will be able to use Snap Maps to see where there friends are at — and when a Snapchatter is covered by the totality of the eclipse, their Bitmoji will throw on some glasses. Along with a few special geo-filters and stickers for eclipse, this is Snap’s first “Actionmoji,” with Maps tied to a moving event. Snapchatters can tap on the map to see the eclipse from different points-of-view, and submitted Snaps will be displayed on its Discover page for the next few days.